New! Send Beautiful Email Campaigns Within Seconds! Got something that you’re just bursting to share with your clients? Launching a new service? 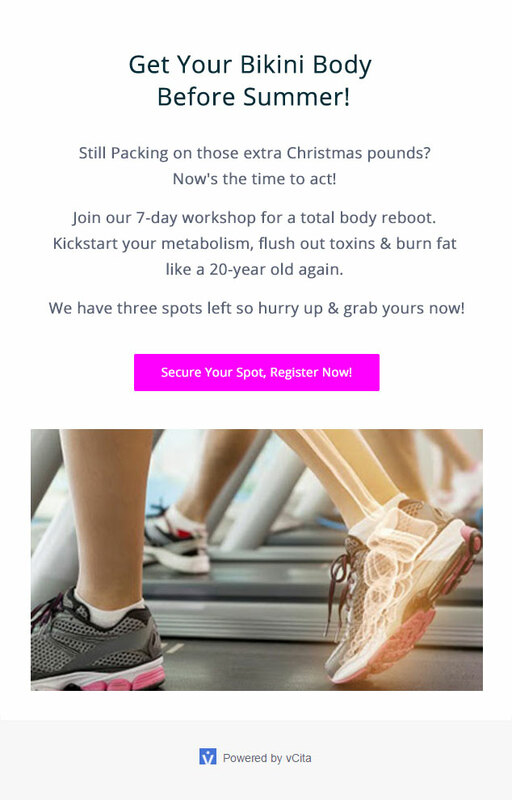 Ready to reveal your latest workshop? Perhaps a fresh promotion that’s just too good to pass up? Excellent news, especially if you’re a vCita user! We’re thrilled to announce that you can now send irresistible email marketing campaigns directly from your vCita dashboard. Our new email marketing feature, “Campaigns”, was designed with absolute beginners in mind: It’s quick, requires no set-up and has a zero learning curve. Even if you’re a marketing newbie just learning the ropes, vCita’s email solution gives you the tools to market your business as a pro and stay ahead of the game. As a company serving over 100K small business owners, we understand that new bookings are your lifeline. That’s why we’ve created an email marketing platform with a single, laser-focused goal: winning you more appointments. Unlike traditional email marketing platforms that focus on visual bells and whistles, vCita’s “Campaigns” feature is 100% performance-oriented. In other words, every single email campaign that you send will prompt your clients to perform a strategic, revenue-generating action for your business. Want your recipients to book a session? Join an event? Pay online? Check out your site? We put your calls-to-action front and center, impossible to miss and crystal clear. When your prospects take action, you get paid. It’s that simple. 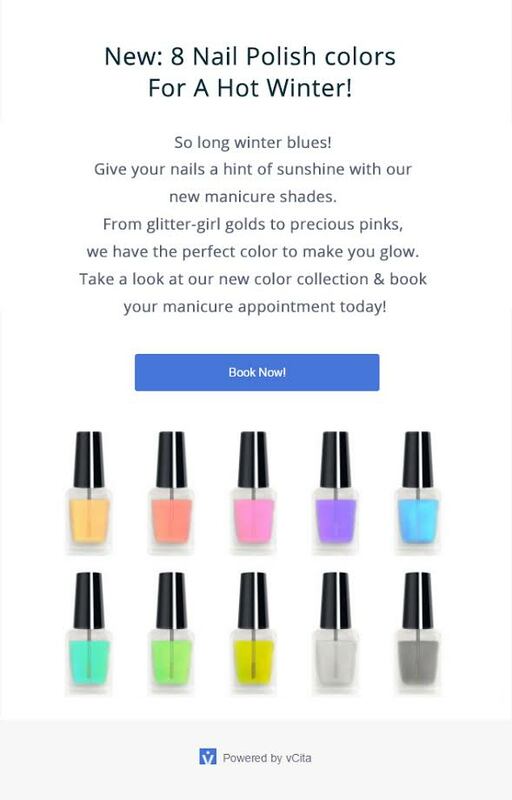 Check out this example of a campaign inviting clients and prospects to book an appointment. The “Book Now!” button leads directly to your vCita scheduler, allowing clients to book an appointment in seconds. Hey, remember all those overdue invoices you’ve been chasing lately? 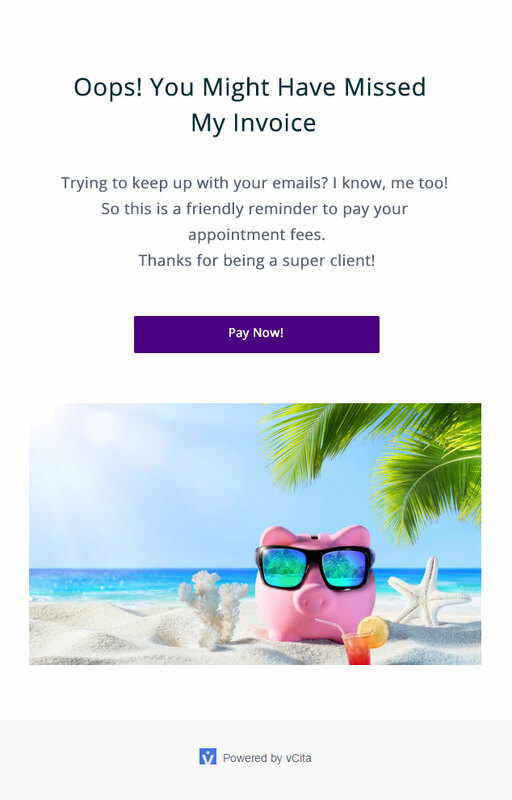 Why don’t you stop chasing and instead send a friendly reminder for clients to pay up? With our email tool, you send quick and painless reminders to your clients which allow them to pay you in an instant. Want to invite a client to your next event? Go for it! When it comes to your email campaigns, sending is only half the battle. After all, how do you know if your messages are being opened in the first place? Do you know which calls-to-action are driving the most clicks? You need to understand how your campaigns are directly impacting your bottom line if you want them to be effective. Thankfully, our “Campaigns” feature boasts built-in analytics which provides real-time data on your campaign’s performance. On your stats screen, you can see how many of your clients and prospects have actually responded to your email offers. In other words, your email efforts can be effectively measured, understood and assessed at a glance. Likewise, you can save, duplicate and resend your best campaigns if you’ve found something that really resonates with your readers. No more guessing games: just fine-tuned email campaigns that you can roll out time and time again. Going Somewhere? Craft Email Campaigns On-the-Go! Let’s get real: rarely do you ever have time to sit in front of your desktop to craft each and every email you need to send. We understand. That’s why we made it a priority for users to send emails directly from their smartphones and mobile devices. You can create killer campaigns from anywhere, regardless of whether you’re at your desktop or on-the-go. Messages crafted via our “Campaigns” feature are 100% responsive and will look great on any screen. Want to Learn More? Try Out Our “Campaigns” Right Now! Simple, straightforward and easy-to-use out of the box email marketing doesn’t have to be a headache anymore. We’d pretty proud of our email campaigns feature and invite you to check it out for yourself. All you need is a vCita account to get started! If this is your first time sending a campaign or if you’re looking to get more juice from your emails, check out this incredible webinar for some best practices. You can also visit our FAQ section for all your important questions.